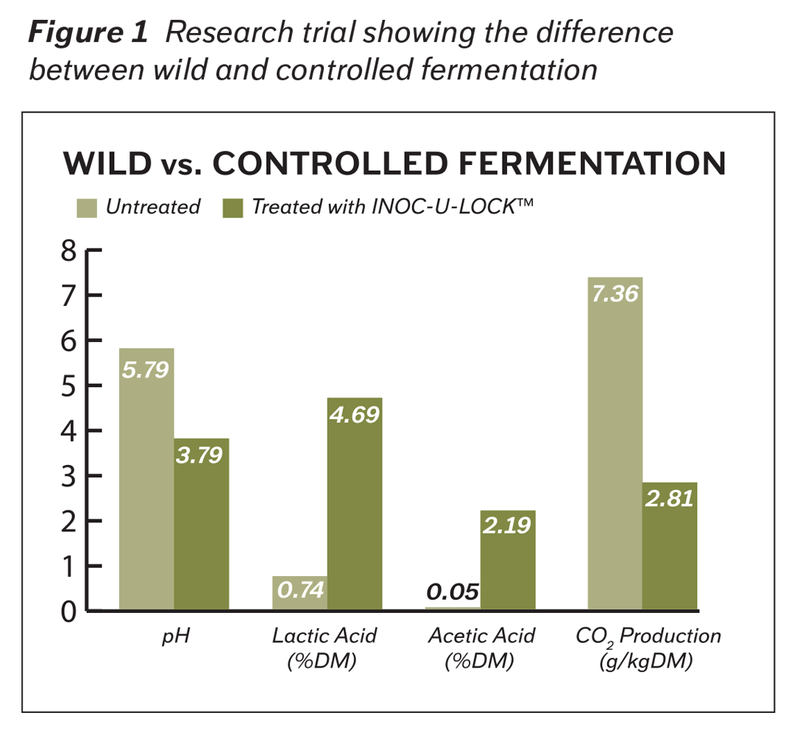 Wild fermentation relies solely on the bacteria normally found on the feedstuff, which in many cases is inadequate for optimum fermentation (See Figure 1). Inoc-U-Lock™ contributes 5 different strains of bacteria to the fermentation process. Each strain of bacteria produces acids (lactic, propionic or acetic) to lower the pH to a range where the next strain of bacteria can take over. The next bacteria strain then produces more acids to continue lowering the pH, until another specific bacteria strain takes over in its optimum pH range. Much like a relay race, each bacteria strain is doing its job and then handing off to the next bacteria team in a controlled step-by-step process, which quickly drives the feedstuff pH to < 4.0. Inoculants containing only one or two bacteria strains, or having bacteria that are weak performers, may not provide the level of control needed to drive optimum fermentation. 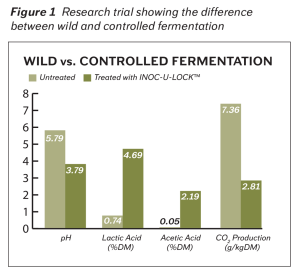 Relying on wild fermentation to fill in the pH gaps is just too risky. Inoc-U-Lock™ with its strategic team of bacteria, provides a more driven and controlled fermentation process. 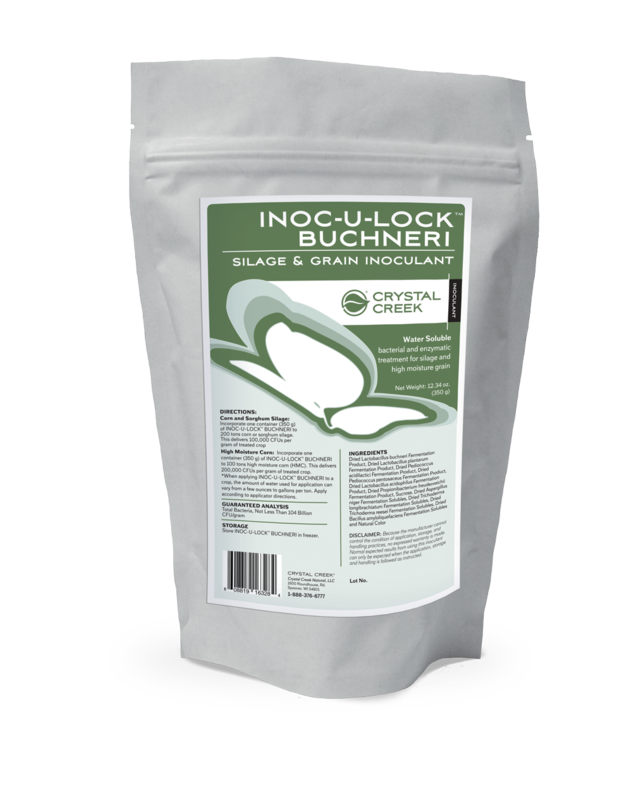 Inoc-U-Lock™ also provides 4 categories of enzymes to help make critical nutrients available to the bacteria, allowing the bacteria to produce the acids necessary to lower the pH. 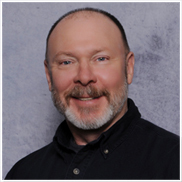 A well built enzyme program will add strength and control to the fermentation process, further reducing the risk of lost revenue. Having aerobic stability on a feedstuff means that when exposed to air, microbes like yeast have difficulty growing, which results in less heating and spoilage of the feedstuff. 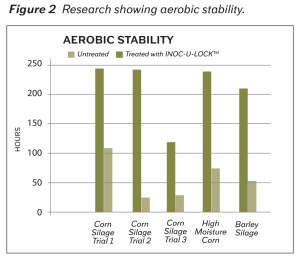 Research shows that the Inoc-U-Lock™ formula is effective at improving aerobic stability in different types of feeds and their associated storage methods (See Figure 2). Inoc-ULock™ reduces the risk of molding and heating on the storage face (piles, bunkers, silos) and in the feed bunk, which means less wasted feed, improved dry matter intakes, better production and improved profitability. Lactobacillus buchneri (L. buchneri) bacteria has become popular in recent years because of its ability to provide additional aerobic stability, thereby supporting even better storage face quality and longer bunk-life to feedstuffs. It is important to know however, that L. buchneri does not contribute to the fermentation of the feedstuff. It generally takes several weeks before L. buchneri starts to function in the feedstuff, well after the pH has been lowered to 4.0. When L. buchneri does start to function, it eats lactic acid (which has been produced by the fermenting bacteria to drive the pH to < 4.0) and produces both acetic acid and carbon dioxide. Having L. buchneri in an inoculant will help to control yeast growth once the feedstuff is already fermented. By reducing yeast growth, L. buchneri can provide additional aerobic stability, further reducing storage face spoilage and heating in the feed bunk. Because L. buchneri contributes nothing to the necessary fermentation process, it should not be the only bacteria in an inoculant. Using only L. buchneri is essentially the same as having a wild, uncontrolled fermentation which is very risky. A fully formulated inoculant like Inoc-U-Lock™ should be applied to the feedstuff to drive a controlled fermentation. 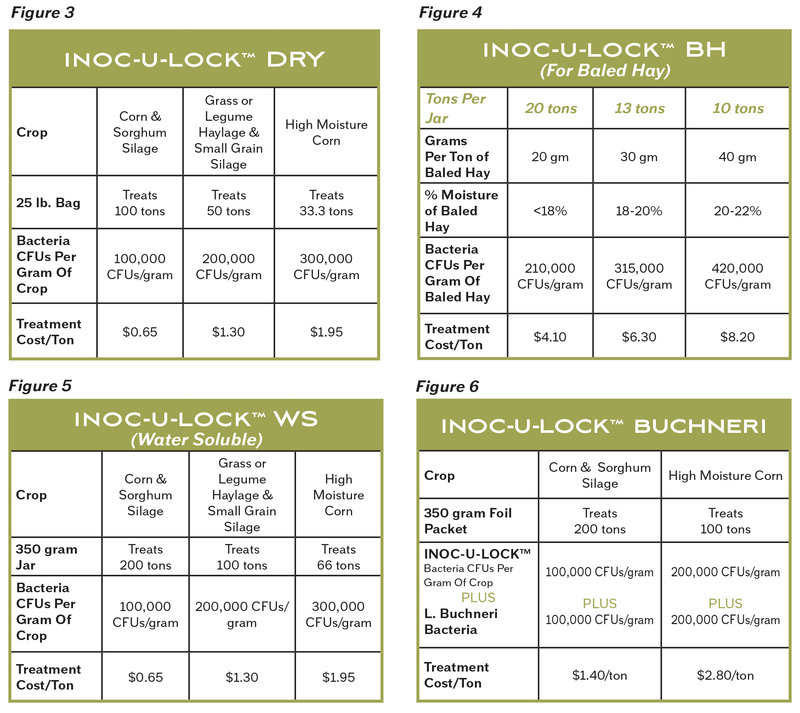 Inoc-U-Lock™ Buchneri is a fully formulated fermentation inoculant that contains both P. frendenreichii bacteria and L. buchneri bacteria to help stabilize the face of ensiled/fermented feeds as well as feed in the bunk. These two bacteria work together to protect feed that has been exposed to the air and reduces the risk of heating and spoilage. The preferred feedstuffs for application of an Inoc-U-Lock ™ Buchneri is grain silages like corn silage or high moisture grains like high moisture corn. It is not recommended to put L. buchneri on haylage or balage type feedstuffs due to their lower carbohydrate levels and lower risk of yeast growth. 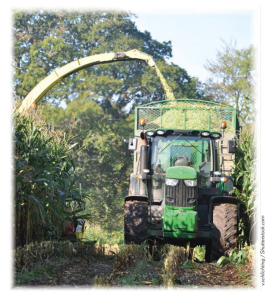 Research indicates that the proper application rate of a L. buchneri bacteria would be 100,000 CFU/gram of corn silage and 200,000 CFU/gram of high moisture corn. Adding higher levels (over 100,000 and 200,00 CFU/gram respectively) of L. buchneri to feedstuffs is not necessary for good performance (in most cases) and only adds unnecessary cost per ton to the producer. Corn Silage: The recommended application rates for Inoc-U-Lock™ Buchneri on corn silage provides 100,000 CFU/gram of the fully formulated Inoc-U-Lock™ inoculant, plus an additional 100,000 CFU/gram of the L. Buchneri. 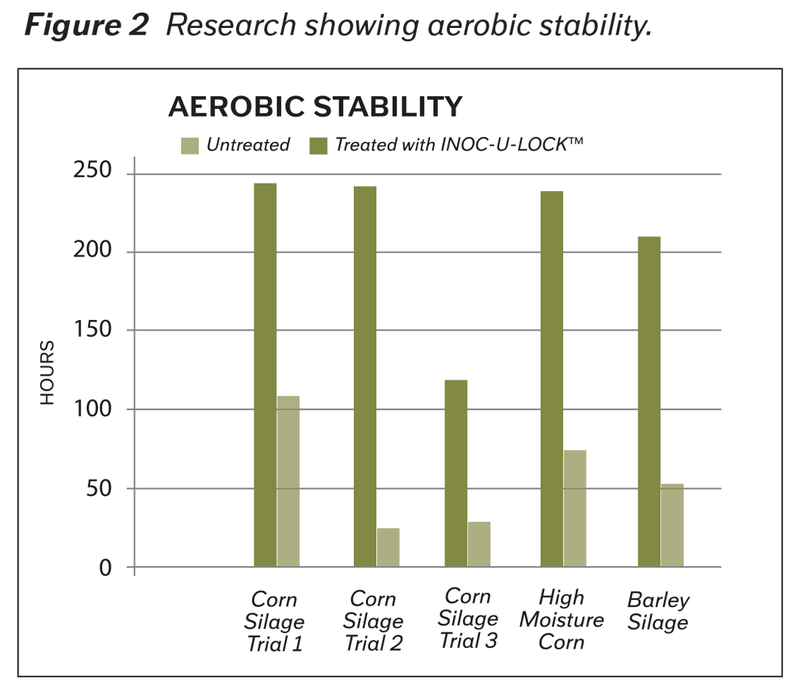 High Moisture Corn: The application rate of Inoc-U-Lock™ Buchneri for high moisture corn is doubled, which provides 200,000 CFU/gram of the fully formulated Inoc-U-Lock™ inoculant, plus an additonal 200,000 CFU/gram of the L. Buchneri bacteria. In extreme need situations, Inoc-U-Lock™ Buchneri could be applied at an even higher level to provide 300,000 CFU/gram of the fully formulated Inoc-U-Lock™ fermentation inoculant, plus the 300,000 CFU/gram of the L. Buchneri bacteria. Storage: Inoc-U-Lock™ Buchneri is only available in a water soluble form, for liquid application. Inoc-U-Lock™ Buchneri needs to be kept in the freezer (freezer – not the refrigerator) for proper storage prior to use. Appropriate shipping techniques and timing of order shipment (to avoid weekend transit) will help to ensure that you receive a viable product. 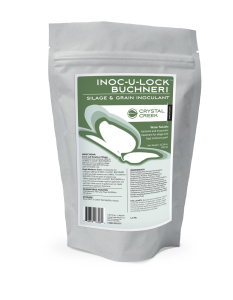 When ordering any of the Inoc-U-Lock™ inoculants, be sure to do so well in advance, so you have your Inoc-U-Lock™ when you need it. 6) Inoc-U-Lock™ Buchneri Meets NOP Standards: Inoc-U-Lock™ Buchneri is formulated to be allowed for organic use. Check with your organic certifier to verify its ability to be used for organic production before applying. Crystal Creek® Offers A Full Line Of High Performance Inoculants For All Of Your Ensiling Needs, (See Figure 3, 4, 5 and 6). 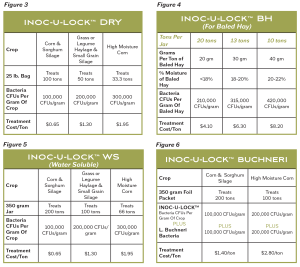 The Inoc-U-Lock™ line of inoculants are excellent, high performance products, and offer great value. You will find that using Inoc-U-Lock™ in your operation is a smart business decision! DISCLAIMER: Because the manufacturer cannot control the condition of application, storage and handling practices, no expressed warranty is made. Normal expected results from using this inoculant can only be expected when the application, storage and hauling is followed as instructed.